The Vandals were a east-Germanic tribe. They were settling around the Oder River area in the first century. They had two main groups, the Harii and the Silingi. Tacitus asserts that the Harii were a part of the Lugii, which were not the same as the Germans which made up the Suebi (their kingdom was destroyed by Visigoths) tribal alliance. The Harii were also known as the Hasdingi; which was a name that came from their ruler dynasty. In the second half of the second century the Vandals started migrating to the south. Accompanying the Marcomanni, they were involved in the so called Marcomannic Wars (165-180). In 174 the Roman emperor Marcus Aurelius granted them the right to settle in the territory of Dacia (today’s Romania). During the third century the Vandals invaded Roman provinces from the territory of Dacia. Even though Dacia was no longer a Roman province from 270, the Vandals stayed in the general area. They were driven from it later by the Goths, and they migrated into Roman Pannonia. In Pannonia the Vandals mastered horsemanship. The Roman Emperor Constantine the Great (324-337) officially granted them the right to settle in Pannonia if they agree to serve in the Roman army as cavalrymen. The Vandals converted to Arian Christianity in Pannonia. They invaded Transylvania in 335 under the leadership of their king Wisimar, but they were defeated by the Goths. 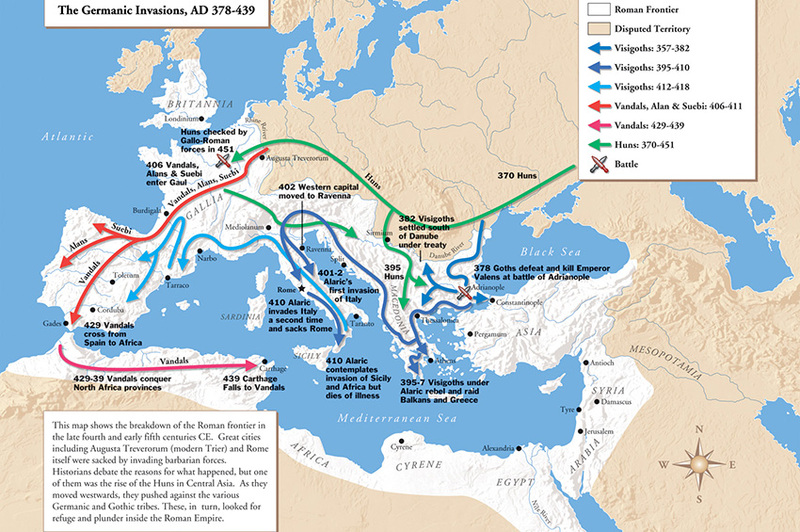 By the end of the fourth century and with the emergence of the Huns the Vandals left Pannonia and started heading towards Noricum and Raetia. They crossed the frozen Rhine River along with the Suebi, Alans, Alemanii and Burgundians early in the fifth century. They entered Roman Gaul and settled there until 409. They crossed the Pyrenean Mountains in the same year where they formed various states. The Hasdingi and Suebi settled in the region of Galicia in southwestern Spain, while the Silingi settled in the region of Baetica in southern Spain. The Alans settled in Lusitania, which is nowadays Portugal. The Visigoths advanced into the Iberian Peninsula in 413 under their king Ataulf (410 – 414). Since the Visigoths were formally accepting the western Roman emperor and his rule they waged war against their Germanic brethren on their own behalf, and for the good of the Roman emperor. The Vandal tribe of the Silingi was almost completely annihilated by the Visigoth king Wallia (414-418). Another Visigoth ruler, Theodoric II (451-466), destroyed the Suebi state in Galicia in 456. Gaiseric made the decision to cross into northern Africa with the Alans from the Iberian Peninsula, since the Vandals were exhausted from all the fighting. Victor, the bishop of the African town of Vita, writes that Gaiseric firstly counted his men to see how much ships will be needed for the transport. The census was made among all the males of the Hasdingi and Alans, as well as for the slaves and freemen. Allegedly there were 80,000 people, 20 to 25,000 warriors. In 429 the Vandals landed on the shores of northern Africa. The situation that they found was quite chaotic, because there was a raging battle between the Catholics and Donatists. The Vandals used the situation to conquer a number of very important cities. For example, in 430 they conquered Hippo Regius, the bishop of this town, Augustine, died during the siege. In 435 the western roman emperor Valentinian III (425 – 455) gave them the status of allies. In 439 Gaiseric dared to conquer Carthage, the second most important town in the Western part of the Roman Empire. The Alano-Vandals conquered northern Africa in one decade. Since he controlled the breadbasket of the Western Roman Empire, Gaiseric proclaimed an independent kingdom. He successfully defeated a Roman invasion in 441, and the government in Ravenna recognized the independent Vandal kingdom in 442 Emperor Valentinian III even bethroned his daughter Eudocia to Huneric, the son of the Vandal king Gaiseric. Gaiseric confiscated the fiefs of the great landlords; he divided the fiefs to smaller parcels and granted those to his warriors. However, the Vandals were not really fond of agriculture and they would rather spend their time as pirates. They strengthened the fleet that they captured with their own ships and started raiding. They raided the Balearic isles, Sicily, Sardinia, Corsica and even the southern shores of Italy. Gaiseric’s dream was to plunder Rome. The opportunity for this would soon present itself. Emperor Valentinian III was dethroned and killed by Petronius Maximus. Petronius married the wife of the former emperor and decided that he would not honor the betrothal of Eudocia to Huneric. This was the cause Gaiseric needed to attack Rome. Petronius was stoned by the people of Rome when he tried to flee the city upon the news that the Vandals are advancing on Rome. The Vandals entered Rome on the 2nd June 455 Pope Leo I (440 – 461) was unsuccessful in his attempt to persuade the Vandals to spare the city, although he successfully persuaded Attila in 452. 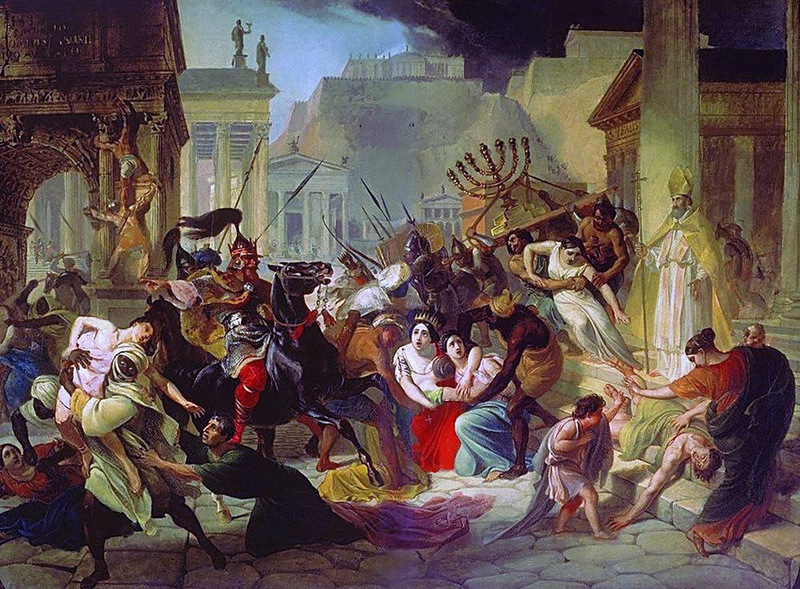 The Vandals plundered Rome for two weeks with such intensity that the term “Vandalism” was coined. Finally Gaiseric decided that he would return to northern Africa and he took the widow and daughter of Valentinian with him. Gaiseric raided the southern parts of Italy arguing that he was collecting the bridal gifts for Eudocia; she married Huneric in 456. Gaiseric raided the northern Peloponnesus in 467. This way he opened another conflict with the eastern Roman emperor Leo I, who organized a expedition against the Vandals with his western roman counterpart Anthemius (467 – 472). The Roman fleet consisted of 1113 ships and around 100,000 men under the leadership of Leo’s brother-in-law Basiliscus. In 468 Basiliscus arrived at the shores of Carthage. Gaiseric attacked the enemy fleet with fire ships and after that with his actual fleet; the romans were defeated and Basiliscus retreated to Sicily, and the Vandal kingdom was not attacked by the Romans again. The death of Gaiseric – Gaiseric died in 477, leaving behind a kingdom that stretched from Mauretania in the west to the province of Africa in the east which consisted of the Balearic Islands, Sicily, Sardinia and Corsica. The Vandal kingdom was suffering from internal conflicts after the death of Gaiseric. The conflict was between two factions, the first one was led by king Hilderic (523 – 530) which led a mild policy regarding the conquered Romans. The other faction, the Arian aristocracy, was led by Gelimer. Gelimer’s forces prevailed and he was crowned (530 – 534). In the meantime the Eastern Roman emperor Justinian I (527 – 565) was working towards a reestablishment of the Roman Empire. In 533 he sent Belisarius with 18,000 soldiers against the Vandals. By 534 he conquered their kingdom, captured Gelimer and imprisoned him in Constantinople. In 536 the Vandals rebelled against the Byzantines and this is the last time they are mentioned.